The name Feng Shui is a poetic Eastern way of describing an understanding of the energy of the earth, the seasons, the sun and moon, and nature. But this all exists and continues without (or despite) us. You don’t have to believe it – it just is. Just like you don’t have to believe that the sun will rise. Using this knowledge is a way of working with nature. Nope – some people may wax evangelical about its benefits, but it isn’t restricted to any religion. 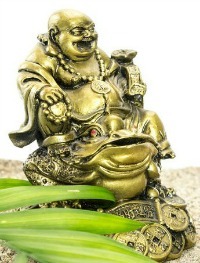 Due to its Eastern links, many traditional Feng Shui Masters were Buddhists but there are no religious connections. The energy of certain directions can be supportive or not depending on your year of birth but there is no single direction that suits everyone. However, the direction of your bed is important to give you supportive energy while you sleep, as this is when you refresh and maintain your health. The only person 3-legged toads will bring money to is the person selling them! Some buildings have money energy, and some don’t. Some have money but it’s draining away. There are many practical ways to improve money energy but a 3-legged toad isn’t one of them. What other odd claims have you heard about Feng Shui? I’d love to know!